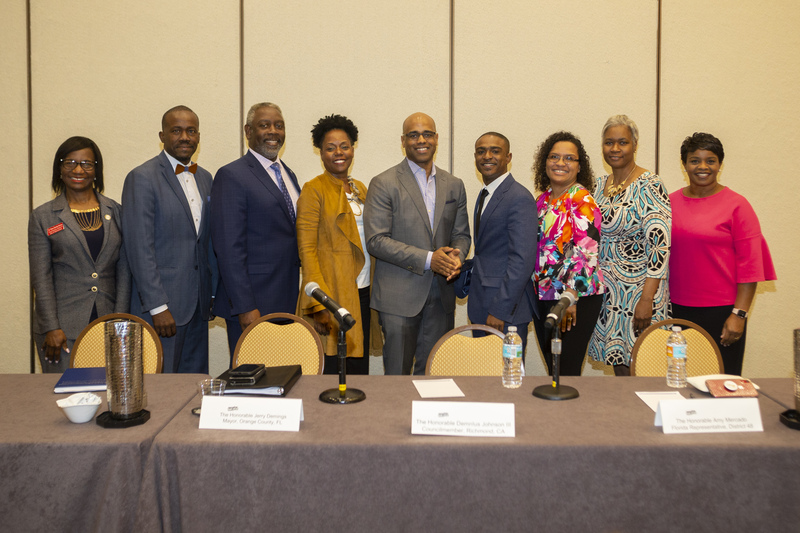 The National Forum for Black Public Administrators (NFBPA) recently held its annual national conference at the Hilton Orlando and hosted more than 1,000 African-American public officials to discuss best practices on leading and engaging communities. The NFBPA is the principal, progressive organization dedicated to the advancement of black public leadership in local and state governments. With more than 2,500 members, the NFBPA has established a national reputation for designing and implementing high-quality leadership development initiatives and programs. Orange County Mayor Jerry L. Demings participated in a panel discussion during the forum’s Town Hall meeting to discuss important topics facing communities, including public engagement and affordable housing. In his remarks, Mayor Demings mentioned how these issues are affecting the Central Florida region. Mayor Demings also mentioned the creation of the County’s Housing for All Task Force. The Task Force’s mission is to promote a transparent system that encourages community engagement in order to address the affordable housing crisis, thus leading to practical, lasting solutions and an increased supply of affordable housing in Orange County. The Task Force is made up of 39 members representing the community, residents and leaders from a diverse group of non-profit organizations and major employers, local builders, real estate developer associations, community partners and financial institutions. Additionally, Mayor Demings spoke with representatives from the South African Consulate to discuss other local initiatives and provide them an overview of the County. Since 1984, the NFBPA has held an annual conference or forum each April for an intensive skills-building and professional development program. The conference is recognized throughout the industry as one of the most important training activities available to public administrators. Photo Caption: Orange County Mayor Jerry L. Demings participates in a panel discussion during the National Forum for Black Public Administrators’ Town Hall meeting on April 6, 2019 to discuss important topics facing communities.